Email marketing is one of the most powerful forms of marketing when compared to other more traditional methods. This is because it has one of the highest ROIs, bringing in right around $40.00 for every $1.00 spent. 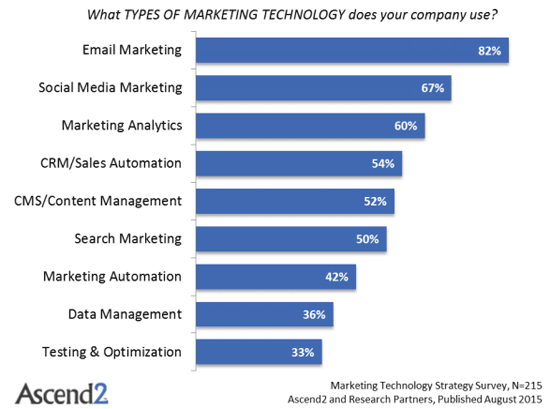 Today, email marketing technology is used by approximately 82% of B2B and B2C companies, according to most recent research by Ascend2. If you’re trying to hold your own in the game as an entrepreneur or small business owner then it’s important to understand the importance of creating successful email campaigns in order to help your business thrive. 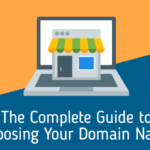 So if you’ve ever wanted to get a quick rundown of the fundamentals regarding email marketing, then you’re in luck, because that’s exactly what this guide is meant for. We’re going to provide you with six sure-fire tactics that you absolutely must use if you’re looking to create successful email campaigns. 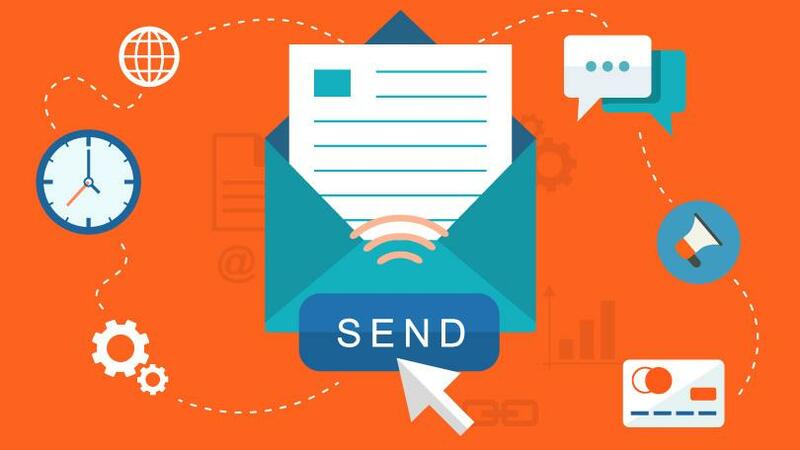 If you’re looking to get serious about your email marketing campaigns then you have to understand the fundamental necessity of an service provider. I’ve seen many small businesses that clearly just do not use email service providers and the problem with this is that unless someone is dying for your product, you’re never going to stand out in the sea of emails without the added benefits that one has to offer. Email service providers such as MailChimp offer numerous valuable resources surrounding both the functionality and aesthetic aspects of your emails. Did you know that just because you send an email does not necessarily mean that the user received it in their inbox? If you tend to send bulk emails out, your account could very easily get red flagged as a spam account. Email deliverability is one of the most important reasons why you should always be using a service provider. Service providers give you peace of mind that your content is being delivered and not being blocked by internet service providers (ISPs) because they are essentially whitelisted by them. Subscription Management is another huge benefit. After all, do you really want to be racking your brain day in and day out manually keeping track of who has subscribed, who has unsubscribed and what preferences they’ve opted in and out for? No – you don’t. Aesthetics and design are other benefits to using a service provider. Providers such as MailChimp and Constant Contact offer user-friendly and customizable templates based on your needs. This saves you endless time and energy while increasing your email marketing effectiveness exponentially. 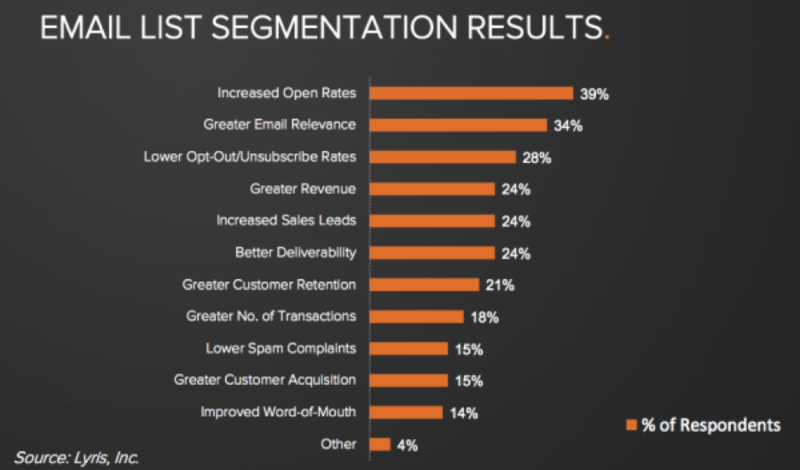 Segmentation is absolutely essential when it comes to increasing the effectiveness of your email marketing campaigns. You simply cannot compete with the endless sea of emails without highly targeted, segmented content. Did you know that approximately 77% of ROI comes from “segmented, targeted & trigger campaigns” according to a recent National Client Email Report? Furthermore, many marketers have noted an increase of up to 760% in revenue due to their use of segmented campaigns. 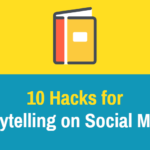 So don’t just send the same content to your entire list across the board. They’re not robots – they’re people with preferences at all different stages in their lives and the buying process. So how do you find ways to differentiate users in your email list? Well, start by offering preferences with your opt-ins so that users can check off the types of emails that they’d like to receive from you. Segmenting based on gender, age, demographic, income and location are also other key ways in which you can stand out and differentiate your messages for maximum impact. Personalization is an awesome little trick you can use to increase the effectiveness of your email marketing. According to Experian, personalized promotional emails have a 29% higher unique open rate and 41% more unique click-through rates. If you’re not currently using personalization as a tactic to increase conversions, then you’re missing out. 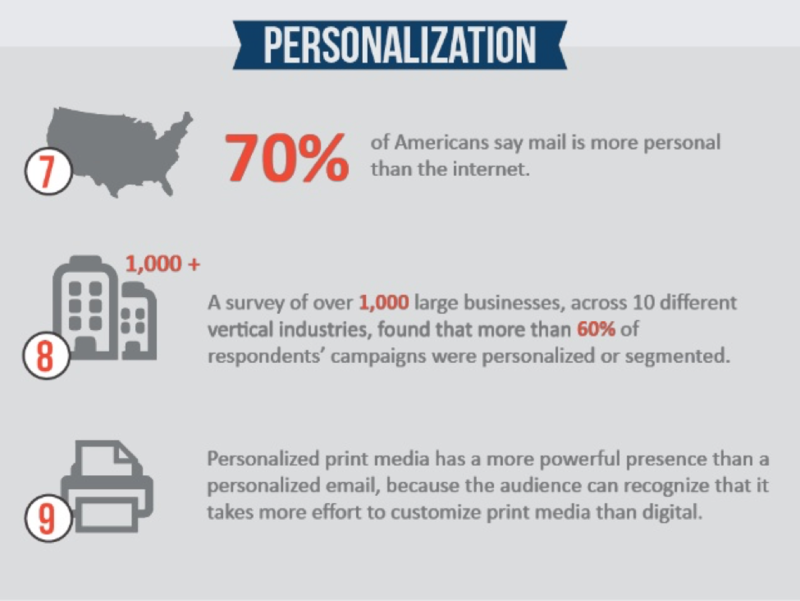 Personalized emails deliver 6x higher the transaction rates for a reason. You’re standing out by acknowledging the individual receiver and you’re making your contact more organic and authentic. So when crafting awesome email content, make sure to use the receiver’s name in the subject line and the body of the email. Another trick to add a personal touch is to make sure that your emails read from an individual and not a business. Why? According to Campaign Monitor, 68% of Americans say the deciding factor on whether or not they open an email is based on who it’s from – and they have a strong preference for emails coming from individuals. Nobody who is anybody is delivering emails manually when it comes to their promotional campaigns. It’s just the truth. An astounding 95% of companies use marketing automation when it comes to carrying out their email campaigns and you absolutely should too. According to the Epsilon Email Institute, automated email messages had “70.5% higher open rates” and “152% higher click through rates” than other forms of standard business marketing emails. Furthermore, 75% of email revenue is generated with the use of trigger campaigns, with automated email campaigns accounting “for 21% of email marketing revenue”. To throw in another for good measure, individuals who have harnessed the power of automation have seen conversion rates as high as 50% according to recent research. 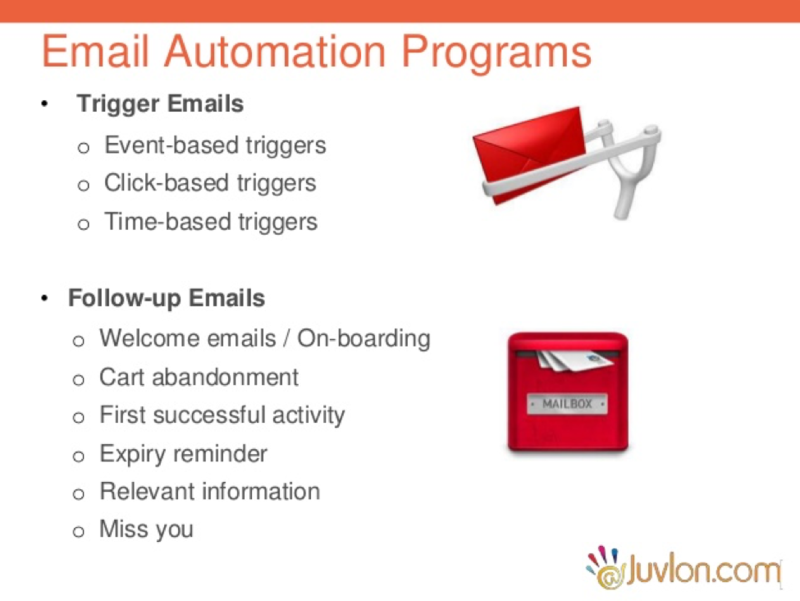 Automation not only proves to be insanely effective with the use of autoresponders and trigger emails based on behaviors, but it is saves you valuable resources, time and energy. What’s the point in crafting your email marketing campaigns precisely for maximum effectiveness if you’re not going to strategically measure the impact of your efforts? Ironically enough, many businesses do just this, but it’s the ones that take a strategic and calculated approach that soar above the rest. When creating effective email campaigns it’s absolutely essential that you analyze the insights received from these so that you can continue to improve upon your numbers (especially if they’re low). Many email marketing service providers such as MailChimp and Constant Contact offer built in analytics platforms for your convenience. 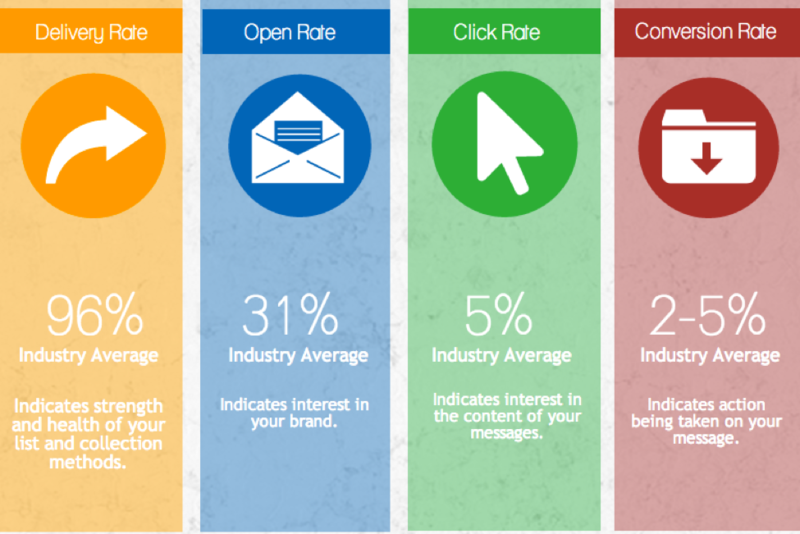 Your open rate shows you in essence, how well you’ve cultivated a relationship with your email list. Low open rates means people simply just aren’t inclined to see what you have to offer. If you struggle with low open rates then you’re going to have to step it up a notch and one of the ways to do this is by offering more value. The solution? Your copy. 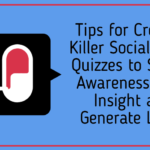 Improve it by keeping it concise, highly-targeted, personalized and well-timed. When it comes to opt-in rates (aka subscription rates) you’ll always want to be pushing for increases and working on ways to captivate and build your email list in as many ways as you can, on as many channels as you can. Making sure your opt-out rates are low (and lower than your opt-in rates) is crucial for sustainability. If they’re close, or you find that individuals are unsubscribing at a higher rate then they’re signing up, then you’re going to have to roll up your sleeves and do some serious work to figure out where the problem lies. Start by analyzing every detail about those that are opting out. Perhaps the majority are doing it after a certain email or perhaps you’re not reaching a certain “type” of subscriber. You may have to revamp your copy, work on better segmentation or the manner in which you present your offers. Regardless, we’re certain it’s been made loud and clear the numerous benefits that analyzing your email marketing metrics can have your campaign efforts.. 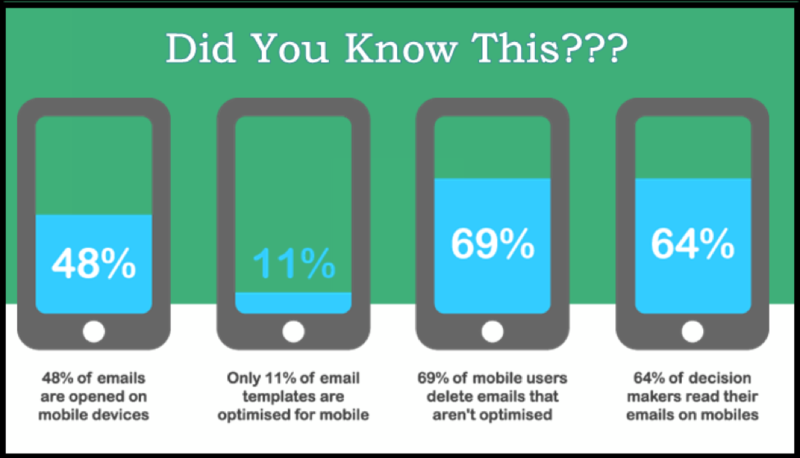 If you’re not optimizing your emails for mobile devices then you’re just wasting your time – point blank. Have you ever received an email on your cell phone and not been able to read a single bit of it because it’s filled with those annoying little empty boxes with the red X’s in the corner? Or maybe the content showed up, but it’s all jumbled and mixed together because it’s not mean to be read on the screen size you’re viewing it on. What do you tend to do with these kinds of emails? Well, I’ll tell you what I do – I delete them. Nobody has time for that. With 53% of emails being viewed on mobile devices (most commonly iPhones), and one out of every three email clicks occurring on a mobile device, it’s absolutely imperative that you make sure you’re offering your reader a visually pleasing, email optimized for mobile display for maximum effectiveness. 92% of adults that are active online use email and about 61% use it on a daily basis. Furthermore, more than 8 in 10 B2B marketers use email newsletters for their marketing according to the Content Marketing Institute. These numbers provide as much insight as anyone could ever need into the wealth of opportunity that is to be had with email marketing. Email marketing has an astounding ROI of 3800% and with numbers like that, it makes you wonder why every small business and entrepreneur on the planet isn’t taking advantage of such a gold mine. Now more than ever is the time to really begin to strive for that competitive edge with your business. So get started on creating a killer email marketing campaign today and we’re certain you’ll see insane results.